Car Park at West End Playground above Boat Quay. Parking charges in operation from Good Friday – March 30th 2018 until Sunday September 30th. Parking is charged from 09:00-6:00pm 7 days per week during this period. Charging stations for electric cars (for customers only) available at Madden’s Bridge Bar and also the Allingham Arms Hotel. Seashells Service Unit – Main Beach – Open 10am – 7pm daily during summer months (June/July/August and weekends in September). The Bridge, Bundoran (behind Tourist Office) – Open 9.30am – 5pm daily. 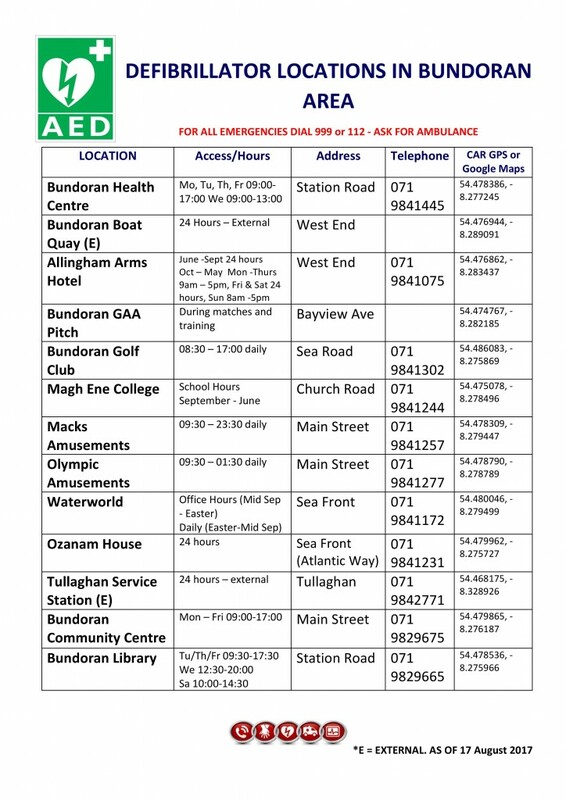 Please remember to always dial 999 or 112 in an emergency – AED units should only be operated by those trained to use them.